NASA is taking part in the celebration of Earth Day’s 42nd anniversary on the National Mall in Washington from April 20 through April 22. The agency’s involvement includes three consecutive days of activities and exhibits open to the public. Additional activities are scheduled at nearby NASA Goddard Space Flight Center in Greenbelt, Md. 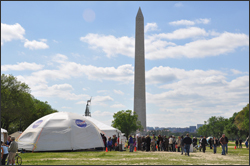 The “NASA Village” on the National Mall will contain activities and exhibits in three tents that highlight the use of NASA science and technology to advance knowledge and awareness of our home planet. The area is located one block west of 12th Street and the Smithsonian Metro station entrance. The Earth and Activities tents will host exhibits and hands-on demonstrations throughout the weekend. Activities include the Weather Versus Climate game, a “Go Green” environment challenge, and Earth Science Pursuit. The Green Theater will feature large satellite images and presentations by NASA scientists and others. On Earth Day, April 22, a performance stage hosted by the Earth Day Network will feature presentations by NASA along with a wide variety of entertainment. A Landsat exhibit will be part of the village. Come learn more about the longest continuous record of Earth’s surface.